The last thing you expect with a six-cylinder open top roadster, driving through the countryside of the German-Austrian border is the smell of cow dung. But then, you’d have to be foolish to not let the roof down and enjoy the European summer. The new Z4 is more of an update. The daytime running lights and the corona rings are now LEDs. The interiors have a new Pure Traction trim that’s replete with orange Alcantara, orange stitching, very good leather and a trim that feels like a steel mesh. Which is all good. What’s also good is that you can now open or shut the full metal roof on the move at a speed of upto 40kph. I am driving the sDrive35is which has a 3-litre staight six petrol engine. With turbos, this engine puts out 340bhp and 450Nm of torque. What India will get is the 35i, which is the same engine that’s detuned to make 306bhp and 400Nm. 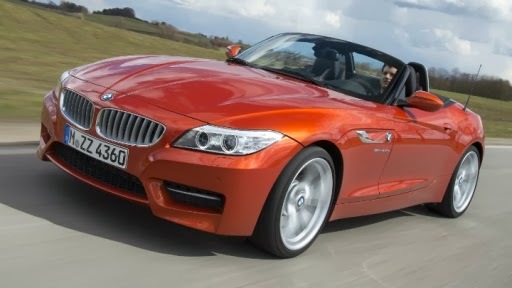 Like the current Z4, the update doesn’t sound phenomenal even with the roof down. It definitely has a loud, rorty note, but misses the smoothness that a naturally-aspirated BMW straight-six has. The car comes with Comfort, Sport and Sport+ modes. In keeping with the sportscar scheme of things, this BMW thankfully doesn’t have an Eco Pro mode or regenerative braking that charges the battery. There isn’t too much of a difference between Comfort and Sport. Engage Sport+ though, and traction control switches off. The steering is light at slow speeds and stiffens up well at higher speeds. The brakes are superb. They offer incredible feedback and stopping power. On the highway, the Z4 is comfortable, refined and effortlessly gathers speed. Despite being a convertible, the car does a good job of keeping wind and road noise outside. And the steering allows you to take corners confidently. However, the car doesn’t feel as nimble and together like a sportscar should. You don’t get that final bit of involvement and that feeling of being one with the car like you would in a Porsche Boxster or a Nissan 370Z. The Z4 is competent, comfortable, capable and convenient. But if you want to be entirely involved in that driving experience and want to make the most of a sportscar experience, Munich is still not the place to be. Competent sportscar that’s comfortable and convenient. But could do with more driver involvement.